Citizens from d ifferent backgrounds including businesses, research institutes and citizen organisations came together on 25 October for a special FIT4FOOD2030 City Lab workshop held at the Food Academy (Toiduakadeemia) in Tartu, Estonia. 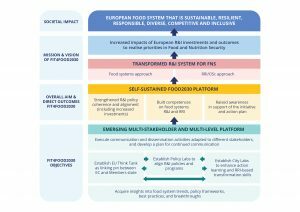 For the FIT4FOOD2030 project, a key aspect of transforming the food system and make it future-proof food system, is identifying showcases (see below); to learn why these are successful and to then take those learnings to other areas in Europe. During the workshop, members of the City Lab in Tartu had a say on the identified cases, enhancing their awareness of very different kinds of innovative ideas in the food world and identifying those developments that matter to them personally and professionally. 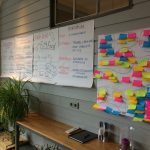 They reflected on what these cases mean, the kind of motivations that are at heart of each initiative, and how impact toward getting food systems ready for the future should be assessed. Showcases are concrete initiatives, social movements, good practices, networks, projects, etc., that have positively affected the food system. They have limited duration and limited impact. Some succeeded, some failed. All of them are inspiring examples, there is a learning capacity in them. Showcase examples around the topic of plant-based protein gathered a lot of attention from participants, who also voiced a desire to organise a panel discussion about food waste in supermarkets. Participants want to get to the bottom of this issue and, having identified innovative showcases that could improve the situation, really want to make a change in Tartu or the whole of Estonia working with actors from across the food system. To top it all up, participants prepared their own lunch under the guidance of the Food Academy team and planned ahead for a busy City Lab schedule for the winter! Interested in joining the discussion? Get in touch with Sander Kask, the City Lab Coordinator in Tartu, by email.